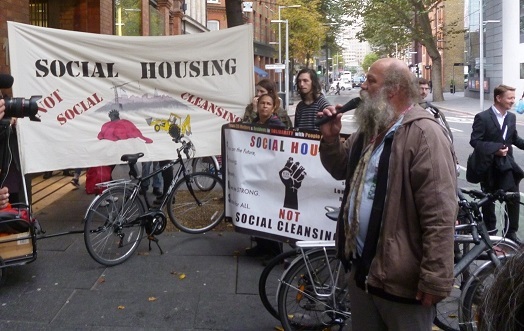 Southwark Association for Mental Health is a new, user-run mental health charity with growing membership, aiming to improve the well-being, civil liberties and social standing of people who experience mental distress. It was formed as an offshoot of the previous Southwark Mind, with the aim that it should continue it's innovative and campaigning and user-led heritage. Many of Southwark Mind's previous projects are now run by the recently incorporated Lambeth & Southwark Mind. SAMH is still in development, but real progress is starting to be made. .We are pleased to be supporting the user-led BME mental health group KINDRED MINDS to re-establish itself following its departure from the former host organisation Social Action For Health. Kindred Minds has been running drop-ins on a shoestring budget during the year, but we have now been awarded some funding from the National Mind Small Grants Committee to renew these activities with complementary therapies, social activities including outings, and peer support training between now and the end of March 2015. Kindred Minds has also been awarded some funds from the Trust for London to appoint a part-time project leader, with the aim of developing a comprehensive BME user mental health Manifesto. The idea is that the Manifesto, which will eventually be available both on-line and as a paperback publication, will be used as a campaigning tool to influence positive changes in mental health services, policies and services, as well as in other factors affecting the lives of BME mental health service users like the police and the welfare system. We hope to appoint the project leader early in the new year and start work on this project as soon as possible. 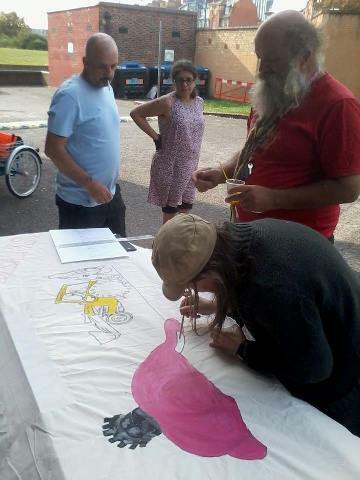 SAMH also supports Mental Health Resistance Network's welfare rights drop-in SolidariTEA - this being an independent project, which recently organised its first public demonstration. Southwark Association for Mental Health produces a quarterly magazine entitled Southwark Mental Health News. The magazine includes articles on up to date issues in your local area. 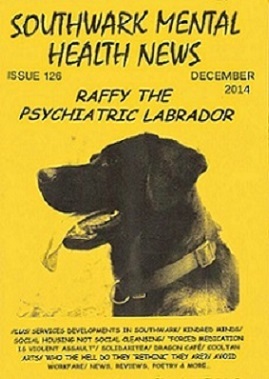 Plus we have our ever popular celebrity dog, Raffy the psychiatric labrador. After all we put the fun in dysfunction. If you would like sign up to our magazine please go to the contact page and fill out form with your details including an postal address and the next issue will be with you along with the adventurous tales of Raffy.